Thanks Jane. Feel free to come any time. Though, I don't have much done. The colored slate is from a church that they re-roofed by my house unfortunately with asphalt roofing. I think that if I were to do it again I'd get new Vermont green and maybe NY red slate for the center of the flower. Don't know if they'd do a small quantity like that, but hey it's worth a shot. Jimmy, I just saw your "foursquarerestoration" website, WOW! Looks like you have some experience doing this sort of thing. More then just the handy home owner. Your job looks fantastic! I'd love to see it sometime if you are interested in showing it off. Where did you get the colored slate? I'm finishing some odds and ends in the back of my house and will be starting on the front and want to do a design but don't know where to get the colored slate. I also ordered that book you recommended. Nice to see your work. Thanks for that Joe. I had been starting at the other end, so hopefully that should do the trick! When you're cutting a piece of roofing slate that comes to a point, such as in a valley or on a hip, start the cut with the pointed end. If you end the cut with the pointed end, it's more likely to break off. Thanks much Planejane. I'll try your suggestions and give it a go. Ok masonry bit got it. Have to look for one of those drill doctors! I had heard from another friend that they are a good investment. Might get a wet saw just for the hip slates, but we'll see. Appreciate the pics- Certainly hope I don't have bad slate, but it's goin' on the roof regardless. All slates ring. Looks great from the ground and the squirrels should be able to enjoy my labors from above! I swear every year I have more of those buggers. Thanks again. Thanks Jimmy for the compliments. If you have a good batch of slate you should be able to get a nice point when cutting. You might have a bad batch. Here are some of the things I have figured out. When you cut the slate I have had better luck if I open the slate cutter up all the way. The arm is high and you push the slate up against the cutter and hold it firmly. Then make small cuts, not one big one. I also start the cut from the opposit end first. I cut the slate an inch or 2 then turn it around and cut it the rest of the way. This may help get that point. Also, if you watch some of Joe's video's, he shows the right technique that I just mentioned to do a basic cut. Open the cutter wide and hold firmly when pushing down. In my closed valleys, I cut the part that goes into the valley upside down. I don't want the tappered edge showing. I want the part that forms the valley to be smooth and flat to make a good tight fit. The tappered cut goes down and the smooth side is up. So if you are doing closed valleys look at my pictures and you won't see that tappered edge from cutting it because it's down. Having the tappered edge down also helps it to be a nice tight fit. Also, read what the guys told me so that you can get the angle right, that part is a real challenge, at least it was for me. 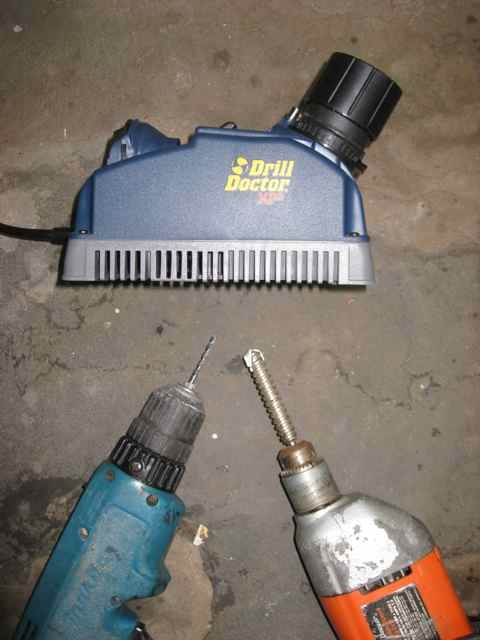 I am showing a picture of my drill bits and my "Drill Doctor" to sharpen the bits. Love that thing! Hi Planejane. Love looking at your posts. Doin' a great job. The problem is now mostly at the very point of my cut. Like a cut you may have in a valley. The very point might brake off an inch or worse. I was thinking I might try a wet saw for just those cuts. Only problem is that I don't have a nice rough edge showing. I'm intrigued by the countersink. What type are you using for that? Jimmy, I'm not a professional but I had the same problem. I see you already solved the problem but, here is what I figured out with some help and a lot of trial and error. Tuke said to "ring" your slate. Here is how I do it. I have a wooden hammer handle without the hammer end on it. I hold the slate with my finger tips in one corner and then take the wooden handle and tap the slate. If the slate has a crack that you can't see, you can for sure hear it. I got a bad batch of slates where 1/2 of them were cracked. It was a real problem. Another way of seeing the crack is to wet the slate. The crack is the last thing to dry and you can sometimes see the crack this way. The best way to see if it's cracked though is, to "ring" the slate. I ring every single slate before I use it. Do it a few times and you will easily hear the difference between a good and a cracked slate. If you are doing it a different way I'd like to hear about it. As far as the holes are concerned; drill them! I have 2 drills set up. One is to drill the hole and the second drill I use to counter sink it. I lost so many slates trying to punch the hole (I did get better at it). I haven't lost one slate since I started drilling! I do use masonry drill bits. Thanks Tuke. Yes, I ring each slate. Regarding the nail holes, I no longer have the problem of the slate breaking thanks to Old Schools comment with laying the slate flat on a board. Works very well. I can cut the slate just fine every way except on a diagonal cut. Much of the slate has a diagonal grain and it will sometimes break on the grain. Hope I make sense. I have a hip roof so I have lots of diagonal cuts. Doesn't happen all of the time though- It's probably bad technique on my part. Though I'm getting much better at it. Hard work. I have the upmost respect for all slaters. Are you punching the nail holes from the back? Ring your slate before you punch it. If it goes thud its not a good slate and will end up breaking. I use a slte hammer and a stake for cutting. 1/4 to 3/8 thick is beefy enough so that it is not critical that the nails be "set" into the slate. They should still be flush however. For a long time we used to use the ESCO cutter similiar to the new inexpensive ones that Joe is selling. They are light and they work well. Last year when we roofed the shelter in Kentucky at the convention we installed the buckinghams on the roof. Very nice slates. They will last a long time for sure. They do vary though and some can be bittle. I hope that is not the case with the used ones you are using. Keep us informed. Hi Old School. I use the Stortz 95-FB Cutter which I purchased here. Most slates are about 1/4 to 3/8" thick. The pre-punched holes that came with the slates don't have much of a crater either.Haven't tried that method to punch a hole though. I'll give that a shot tomorrow. Thanks. Did you try laying the slate flat on a board and then hitting it to punch a hole? That works well sometimes. How thick is it? What type of cutter are you using? I've recently started slating my house with salvaged Buckingham and I'm having a hell of a time cutting the slate on a diagonal where it meets the hips. For some reason part of the slate would crack and fall off. This happened a lot to me yesterday. I use a slate cutter and I do use a relief cut. Just wondering if there is a different technique when using this slate. Also regarding punching it generally works better using the hole punch on the cutter. Sometimes shatters using the slate hammer but not always. Trying to produce a crater with the tip of the slate hammer is sometimes futile as well- Just goes tink..tink and difficult to make a crater. I'm guessing I just need more practice punching with the end of the hammer right? I've been cutting the slate in half and making fishscales with no problem at all and now this. Figure I'd ask the pro's. Must have breathed in and counted to 10 --30 times yesterday!